A while back I reviewed Daniel Kane’s Don’t Ever Get Famous, a book of essays he edited on the New York School of poets. Kane’s decision to stray from the beaten path was one of the selling points of that book. No heavy doses of Kenneth Koch, John Ashbery, James Schyuler or Frank O’Hara. For the most part, Kane selected essays on lesser known figures and aspects of the New York School. Well, Kane has a new book out, We Saw the Light: Conversations between the New American Cinema and Poetry. In each of the book’s seven chapters, one poet is paired with one filmmaker in order to examine the inter-relationship or conversation between them. Once again, Kane charts new territory. Critics have turned their attention to certain aspects of this area, such as the Beats and film. Think Jack Sargeant’s Naked Lens: Beat Cinema or David Sterritt’s Mad to Be Saved: The Beats, the ’50s, and Film. A few studies examine the influence of New American Poetry on New America Cinema, such as R. Bruce Elder’s study of the films of Stan Brakhage, but the influence in the other direction, of New American Cinema (think Stan Brakhage, Kenneth Anger, Andy Warhol, Rudy Burckhardt, Robert Frank, just to mention some filmmakers featured in Kane’s book) on New American Poetry (i.e. the Allen Anthology poets), has not received much, if any, critical attention. Throughout We Saw the Light, Kane explores this path not taken, such as in a reading of John Ashbery’s poetics through the lens of Rudy Burckhardt’s film Ostensibly. Kane’s analysis is wide-ranging, touching on earlier work like Burckhardt’s Lurk and Ashbery’s Three Poems as well as the poetry of Robert Frost. Chapters on Robert Duncan / Kenneth Anger and Stan Brakhage / Robert Creeley possess similar breadth and depth. The book concludes with an interview with Lisa Jarnot (poet) and Jennifer Reeves (filmmaker) on their collaboration The Time We Killed (2004). This interview highlights the fact that the collaboration between experimental poetry and film is still ongoing and vibrant. This concluding chapter also integrates what had until then been a boy’s club. I want to look at three chapters in Kane’s book in some depth. Let’s start with the chapter on Allen Ginsberg and Robert Frank. One would expect a discussion of Pull My Daisy, the most famous Beat film and Howl, Ginsberg’s most well-known poem. Such considerations have been done before, for example in Naked Lens and in Mad to Be Saved. In We Saw the Light, Kane passes on examining Pull My Daisy in any depth and chooses to discuss the cinematic aspects of Howl from a new and unusual perspective. Obviously, Ginsberg’s use of juxtaposition, best exemplified by the phrase “hydrogen jukebox,” has links to cinematic montage à la Sergei Eisenstein. Kane chooses not to discuss these links in detail. Not because he is unaware of them — Kane touches on this aspect of New American Poetry in another chapter by quoting from Robert Duncan’s The H.D. Book regarding Eisenstein. No, Kane hopes to open up new areas for discussion. The quoting of The H.D. Book is a case in point. Duncan’s long-running project of creative criticism is for the most part unread and unstudied. The reference to The H.D. Book shows Kane digging deep into forgotten or neglected works. We Saw the Light often cites unpublished interviews, little known correspondence, and other texts that a disc jockey would describe as deep cuts. For example in considering the influence of cinema on Howl, Kane singles out the figure of Charlie Chaplin. 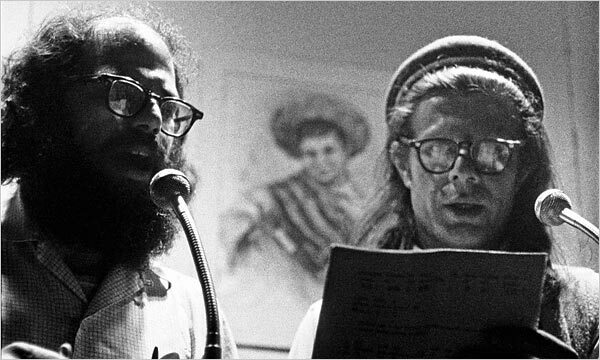 Ginsberg and Peter Orlovsky collaborated on a largely neglected poem entitled “A Letter to Chaplin.” In addition, in his notes on the recording of Howl, Ginsberg wrote, “the whole first section typed out madly in one afternoon, a tragic, custard-pie comedy of wild phrasing, meaningless images for the beauty of abstract poetry of mind running along making awkward combinations like Charlie Chaplin’s walk.” The reference to “abstract poetry” highlights the well-documented influence of abstract art on Howl, namely Cézanne, whose juxtapositions of form and color Ginsberg studied intently while developing his own signature style. Kane takes this note on Howl to explore Chaplin as an alternative, and lesser known, cinematic inspiration behind Ginsberg’s “wild phrasing” and “awkward combinations.” Unlike Cézanne, the figure of Chaplin also provides transgressive sexual and political implications. “A Letter to Chaplin” in its subject matter encourages just such reading. Through Chaplin, Kane probes the links between poetic experimentalism, sexual freedom, and political radicalism that underlies Howl. In addition, Kane focuses on a lesser known Ginsberg / Frank collaboration: Me and My Brother as well as the even more obscure film version of Kaddish, an abandoned project out of which Me and My Brother developed. Me and My Brother is considered in connection with Wichita Vortex Sutra. In a wide-ranging analysis, Kane demonstrates how Ginsberg drew inspiration from, and in turn influenced, Frank’s work. In this light, it becomes clear how Ginsberg’s interrogation of language and reality in “Wichita Vortex Sutra” and other poems of the mid-1960s parallel similar concerns of Frank’s. Ginsberg’s poetics of this period also incorporate Frank’s cinematic techniques of editing as well as his photographic style. Ginsberg’s use of a tape recorder to create these poems mimics Frank’s use of a camera on several levels. The chapter on Frank and Ginsberg sheds new light on their collaboration and the fruits of that collaboration. Similarly, the chapter on Frank O’Hara and Alfred Leslie is fresh and informative. O’Hara drew much inspiration from Hollywood, and this fact is well known and documented. Poems like To the Film Industry in Crisis and Poem (Lana Turner Has Collapsed) are obvious examples of O’Hara’s love affair with the movies. Yet for the most part, critical accounts focus on the influence and incorporation of popular culture and mainstream film in O’Hara’s poetry. As Kane makes clear, O’Hara interacted with and drew inspiration from the underground cinema as well. 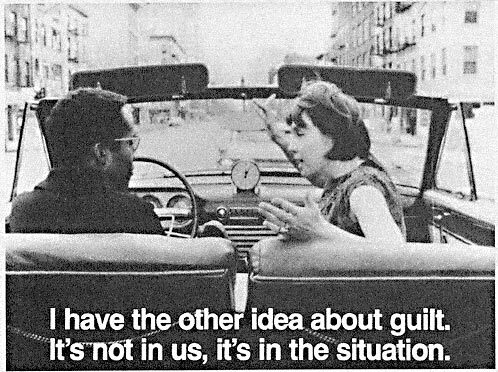 Kane examines the collaboration of Leslie and O’Hara in The Last Clean Shirt (1964). The film, which centers on an interracial couple driving through New York City, is on one level the cinematic equivalent of an “I do this, I do that” poem. Like O’Hara’s poetry, it is very much an urban film focusing on New York City locales. Many critics see O’Hara’s poems as a form of name-dropping performed by an urbane flaneur. As a result, these references are considered on their surface. Instead, Kane uses Last Clean Shirt to highlight how racial and political concerns lie beneath that surface. As a result, O’Hara becomes more of an engaged poet, in a political sense, as well as a poet engaged in the underground of the Lower East Side, not just the art world of Upper Manhattan. The chapter on Andy Warhol was a bit of a disappointment. The chapter seems to me to be something of an afterthought, maybe the suggestion of an editor. I sense that a higher-up felt that the work of Andy Warhol had to be included. I disagree. Warhol’s films have been much discussed in other books. Most significantly, Reva Wolf has discussed Warhol and his relationship to poetry in her book Andy Warhol, Gossip and Poetry in the 1960s. In addition, Kane himself touched on this topic in All Poets Welcome. One of the strengths of We Saw the Light (and Don’t Ever Get Famous) is that it embraces the unexpected and the unexplored. Another strength is that the book examines the interaction between one filmmaker and one poet in each chapter. Yet the Warhol chapter is devoted to the conversations between Andy Warhol, Gerard Malanga, Allen Ginsberg, John Ashbery, and Frank O’Hara. I feel Kane lost his focus a bit by getting away from a tight, compact one-on-one structure. I would have liked to see him narrow his scope and provide a detailed reading of Warhol’s interaction with one poet in particular. Kane examines the screen tests of John Ashbery and Allen Ginsberg. These seem to me to be obvious choices (as is the discussion of Frank O’Hara) which conflicts with more obscure topics covered in the rest of the book. Yet Ron Padgett and Ted Berrigan also sat for screen tests. How about a whole chapter dedicated to the conversation between Warhol and Berrigan? Or Warhol and Padgett? Reva Wolf and Kane himself address these conversations in their earlier books, but, still, such an examination would be more unexpected than discussing Ashbery, O’Hara, or Ginsberg, who are already the subject of chapters in We Saw the Light. I want to stress that this is a small criticism to give balance to this review. Do not get me wrong, I read the Warhol chapter with great interest, and to those not aware of Wolf’s or Kane’s earlier work, the chapter will be a revelation, but for me it was not as fresh and focused as the rest of the book. Kane mentions Burroughs in passing throughout the book and in a footnote or two. For example I was interested to learn that Burroughs appeared in a Stan Brakhage film, Thot Fal’N (1978). I know next to nothing about this movie. It is described on the internet as follows: “This film describes a psychological state ‘kin to ‘moon-struck,” its images emblems (not quite symbols) of suspension-of-self within consciousness and then that feeling of ‘falling away’ from conscious thought. The film can only be said to ‘describe’ or be emblematic of this state because I cannot imagine symbolizing or otherwise representing an equivalent of thoughtlessness itself. Thus the ‘actors’ in the film, Jane Brakhage, Tom and Gloria Bartek, William Burroughs, Allen Ginsberg, Peter Orlovsky and Philip Whalen, are figments of this Thought-Fallen PROCESS as are their images in the film to themselves being photographed.” I would like to know more about this film. Yet due to a variety of reasons, William Burroughs is not considered in detail in Kane’s book. For one Burroughs is considered a novelist, not a poet. Second, Burroughs’ cut-up films were directed by Antony Balch, a British filmmaker, so they technically are not New American Cinema. Finally and most importantly, the cut-up films have been discussed elsewhere in books and in academic articles. They are, to some extent, covered ground. That said, Kane’s book demonstrates to me that an entire book on Burroughs and film is much needed. The book I have in mind would serve the same purpose as Ports of Entry that explored Burroughs and visual art. Clearly, Burroughs has a varied and complex relationship to film. Burroughs utilized cinematic techniques in his writing to great effect. Has there been a study of the relationship of experimental film and the cut-up technique or maybe a close reading of The Last Words of Dutch Schultz screenplay and that work’s relation to the rest of Burroughs’ output? What about the idea of film and filmmaking in Burroughs’ theories on the nature of reality and perception? The saga of the making of Naked Lunch into a film from the 1960s onwards has yet to be told in full. What about Burroughs as an actor? Much could be made of the roles Burroughs played and how they reflect on him as a myth and icon. Some of these topics have been covered in academic articles and in chapters on Beat film but others remain untackled. Maybe a collection of essays like Retaking the Universe is in order. Maybe it is already in the works. In any case, Daniel Kane’s We Saw the Light is on the shelves now and I strongly recommend it. In some cases, it builds on existing material but in large part it opens up whole new areas of inquiry on some of the most exciting and innovative poets and filmmakers of the 20th Century. For anyone interested in New American poetry or cinema, this book is a must-read. Written by Jed Birmingham and published by RealityStudio on 27 April 2009.
i just read Naked Lens last month for the 1st time and loved it. An in-depth Burroughs/film book would be wonderful to behold. GetFamous, a book of essays he edited on stray from the beaten path was one of the Kenneth Koch, John Ashbery, James Schyuler or Frank O’Hara. known figures and aspects of the New York School. Well, Light: Conversations between the New American Cinema and Poetry. is paired with one filmmaker in order to examine charts new territory. Critics have turned their attention to and film. Think Jack Sargeant’s Naked Lens: Beat Cinema the ’50s, and Film. 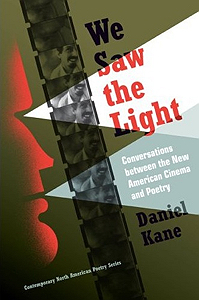 A few studies examine the such as R. Bruce Elder’s study of the films direction, of New American Cinema (think Stan Brakhage, Kenneth mention some filmmakers featured in Kane’s book) on New received much, if any, critical attention. Throughout We Saw as in a reading of John Ashbery’s poetics through is wide-ranging, touching on earlier work like Burckhardt’s Lurk of Robert Frost. Chapters on Robert Duncan / Kenneth breadth and depth. The book concludes with an interview their collaboration The Time We Killed (2004). This interview and film is still ongoing and vibrant. This concluding boy’s club. I want to look at three chapters in chapter on Allen Ginsberg and Robert Frank. One would famous Beat film and Howl, Ginsberg’s most well-known poem. Naked Lens and in Mad to Be Saved. In My Daisy in any depth and chooses to discuss unusual perspective. Obviously, Ginsberg’s use of juxtaposition, best exemplified montage à la Sergei Eisenstein. Kane chooses not to unaware of them — Kane touches on this aspect from Robert Duncan’s The H.D. Book regarding Eisenstein. No, The quoting of The H.D. Book is a case for the most part unread and unstudied. The reference forgotten or neglected works. We Saw the Light often that a disc jockey would describe as deep cuts. For Kane singles out the figure of Charlie Chaplin. Ginsberg entitled “A Letter to Chaplin.” In addition, in his whole first section typed out madly in one afternoon, for the beauty of abstract poetry of mind running reference to “abstract poetry” highlights the well-documented influence of form and color Ginsberg studied intently while developing his to explore Chaplin as an alternative, and lesser known, Unlike Cézanne, the figure of Chaplin also provides transgressive its subject matter encourages just such reading. Through Chaplin, and political radicalism that underlies Howl. In addition, Kane focuses and My Brother as well as the even more of which Me and My Brother developed. Me and Sutra. In a wide-ranging analysis, Kane demonstrates how Ginsberg In this light, it becomes clear how Ginsberg’s interrogation other poems of the mid-1960s parallel similar concerns of cinematic techniques of editing as well as his photographic these poems mimics Frank’s use of a camera on new light on their collaboration and the fruits of Leslie is fresh and informative. O’Hara drew much inspiration documented. Poems like To the Film Industry in Crisis of O’Hara’s love affair with the movies. Yet for and incorporation of popular culture and mainstream film in and drew inspiration from the underground cinema as well. The Last Clean Shirt (1964). The film, which centers is on one level the cinematic equivalent of an poetry, it is very much an urban film focusing poems as a form of name-dropping performed by an on their surface. Instead, Kane uses Last Clean Shirt that surface. As a result, O’Hara becomes more of as a poet engaged in the underground of the Upper Manhattan. The chapter on Andy Warhol was a bit be something of an afterthought, maybe the suggestion of the work of Andy Warhol had to be included. other books. Most significantly, Reva Wolf has discussed Warhol Warhol, Gossip and Poetry in the 1960s. In addition, Welcome. One of the strengths of We Saw the embraces the unexpected and the unexplored. Another strength is and one poet in each chapter. Yet the Warhol Gerard Malanga, Allen Ginsberg, John Ashbery, and Frank O’Hara. getting away from a tight, compact one-on-one structure. I and provide a detailed reading of Warhol’s interaction with of John Ashbery and Allen Ginsberg. These seem to of Frank O’Hara) which conflicts with more obscure topics Padgett and Ted Berrigan also sat for screen tests. between Warhol and Berrigan? Or Warhol and Padgett? Reva earlier books, but, still, such an examination would be are already the subject of chapters in We Saw a small criticism to give balance to this review. chapter with great interest, and to those not aware be a revelation, but for me it was not book. Kane mentions Burroughs in passing throughout the book and interested to learn that Burroughs appeared in a Stan nothing about this movie. It is described on the ‘kin to ‘moon-struck,” its images emblems (not quite symbols) ‘falling away’ from conscious thought. The film can only state because I cannot imagine symbolizing or otherwise representing the film, Jane Brakhage, Tom and Gloria Bartek, William figments of this Thought-Fallen PROCESS as are their images like to know more about this film. Yet due to in detail in Kane’s book. For one Burroughs is films were directed by Antony Balch, a British filmmaker, and most importantly, the cut-up films have been discussed to some extent, covered ground. That said, Kane’s book demonstrates film is much needed. The book I have in Entry that explored Burroughs and visual art. Clearly, Burroughs utilized cinematic techniques in his writing to great effect. experimental film and the cut-up technique or maybe a screenplay and that work’s relation to the rest of filmmaking in Burroughs’ theories on the nature of reality Lunch into a film from the 1960s onwards has as an actor? Much could be made of the as a myth and icon. Some of these topics on Beat film but others remain untackled. Maybe a order. Maybe it is already in the works. In any the shelves now and I strongly recommend it. In large part it opens up whole new areas of poets and filmmakers of the 20th Century. For anyone is a must-read. A while back I reviewed Daniel Kane’s Don’t Ever the New York School of poets. Kane’s decision to selling points of that book. No heavy doses of For the most part, Kane selected essays on lesser Kane has a new book out, We Saw the In each of the book’s seven chapters, one poet the inter-relationship or conversation between them. Once again, Kane certain aspects of this area, such as the Beats or David Sterritt’s Mad to Be Saved: The Beats, influence of New American Poetry on New America Cinema, of Stan Brakhage, but the influence in the other Anger, Andy Warhol, Rudy Burckhardt, Robert Frank, just to American Poetry (i.e. the Allen Anthology poets), has not the Light, Kane explores this path not taken, such the lens of Rudy Burckhardt’s film Ostensibly. Kane’s analysis and Ashbery’s Three Poems as well as the poetry Anger and Stan Brakhage / Robert Creeley possess similar with Lisa Jarnot (poet) and Jennifer Reeves (filmmaker) on highlights the fact that the collaboration between experimental poetry chapter also integrates what had until then been a Kane’s book in some depth. Let’s start with the expect a discussion of Pull My Daisy, the most Such considerations have been done before, for example in We Saw the Light, Kane passes on examining Pull the cinematic aspects of Howl from a new and by the phrase “hydrogen jukebox,” has links to cinematic discuss these links in detail. Not because he is of New American Poetry in another chapter by quoting Kane hopes to open up new areas for discussion. in point. Duncan’s long-running project of creative criticism is to The H.D. Book shows Kane digging deep into cites unpublished interviews, little known correspondence, and other texts example in considering the influence of cinema on Howl, and Peter Orlovsky collaborated on a largely neglected poem notes on the recording of Howl, Ginsberg wrote, “the a tragic, custard-pie comedy of wild phrasing, meaningless images along making awkward combinations like Charlie Chaplin’s walk.” The abstract art on Howl, namely Cézanne, whose juxtapositions of own signature style. Kane takes this note on Howl cinematic inspiration behind Ginsberg’s “wild phrasing” and “awkward combinations.” sexual and political implications. “A Letter to Chaplin” in Kane probes the links between poetic experimentalism, sexual freedom, on a lesser known Ginsberg / Frank collaboration: Me obscure film version of Kaddish, an abandoned project out My Brother is considered in connection with Wichita Vortex drew inspiration from, and in turn influenced, Frank’s work. of language and reality in “Wichita Vortex Sutra” and Frank’s. Ginsberg’s poetics of this period also incorporate Frank’s style. Ginsberg’s use of a tape recorder to create several levels. The chapter on Frank and Ginsberg sheds that collaboration.